Beware of typewriter lovers with a sense of humour. In the past 12 months… maybe a smidge more, I have trained probably close to a dozen people to be able to do my job. And, frankly, it is often boring and exhausting. Even though I love doing it. Doesn’t mean I can’t have a little fun with it once in a while. We’ve hired someone new to work with me. I feel sorry for them for having to put up with me and my…. quirkiness. I thought I would start things off with a bit of some ice-breaking humour on her first day. 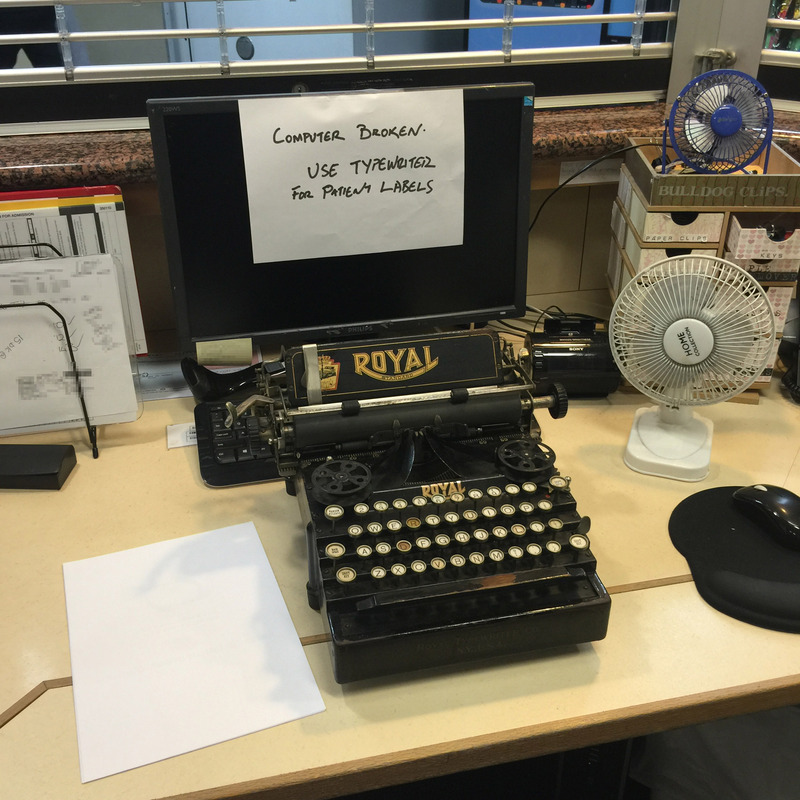 So I set up one of my Royal 5 typewriters our desk, in front of the computer she was going to be working on with a sign across the monitor ‘Computer broken: Use typewriter for patient labels’. I needed something that would just yell ‘antiquated old clunker’, and I slipped into work at about 6:30 am. I caught more than my new co-worker with the joke. One of my managers (I have multiple managers. It’s complicated) just happened to arrive not long after I got set up, and she found me at the back of the building. Thinking the joke was on me, she said “Mate, you’re going to have a hell of a day at the front there’! I returned to find one of the education officers had fed a sheet of labels into the machine, and had started typing frantically on it. Things can quickly escalate in a hospital. So while it was fun at first with the new employee, I had to quickly sit my Royal aside and knuckle down on the job. It wasn’t one of those catastrophic days, but I’m glad that we managed to get a bit of lightness in first, before the brown stuff hit the fan. And hit it did. I’ve worked in healthcare long enough now that I can easily roll with the punches. But I could see that my co-worker was feeling a bit of pressure – in that ‘what the hell have I got myself into’ kind of way. However I’m sure she’ll be fine the moment she finds her feet. In the meantime, I’m trying to figure out how I can get more typewriter air-time at work. I kinda liked having one of my machines there. The Tale Of The Stolen Royal. Computer says “No, no, not that Filthy Platen guy again!” :D.